With the promise of using the body’s own immune system to fight cancer, immunotherapy has received significant interest from the scientific community, bringing hope to patients across many cancer indications. Toxicity issues, which diminish quality of life for patients. In order to optimise agent efficacy and overall patient survival, most of these agents are now used in combination. This shift has led to a proliferation of combination studies and approvals, as well as research and commercial partnerships between top pharma companies and small biotechnology companies with innovative product pipelines. What are the immunotherapy agents currently investigated in monotherapy and in combination? The first generation of agents has shown some interesting results, while also highlighting the limits of immunotherapies in oncology. The second wave of agents encompasses checkpoint inhibitors and cell therapies, among others. Nivolumab, pembrolizumab and atezolizumab are checkpoint inhibitors, meaning that they help the immune system to recognise and kill tumour cells. These three agents have been approved in the US and Europe for multiple indications, where they have shown promising efficacy. Third-generation agents are emerging. These are a broader set, targeting other aspects of the immune system. 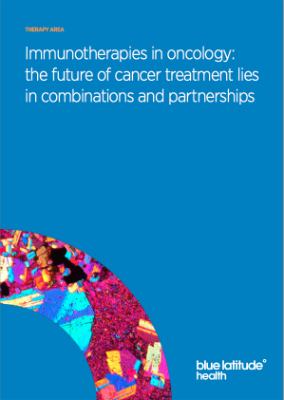 They promise multiple therapeutic options that can be tailored to the patient and offer a wide range of possibilities for combination (Hoos et al, 2016).